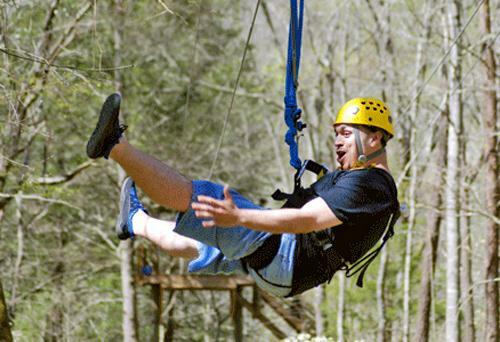 Offered by Rafting in the Smokies, Zipping in the Smokies offers a fun family adventure located in Hartford, Tennessee. 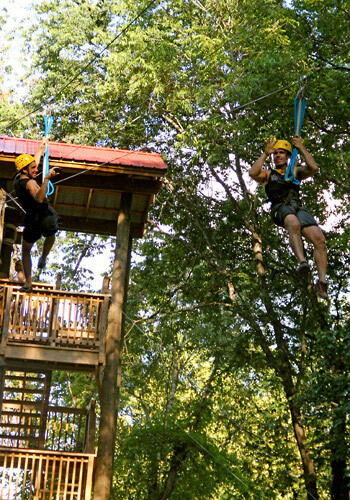 Guests (ages five years and older) can enjoy viewing the 10-acre wooden island from high up in the air, featuring a total of six ziplines crossing two sky bridges. Guests can also enjoy amenities like barbecue grills, picnic tables, swings, nature trails and more. Participants must be between 45 and 250 lbs. Allot 1 hour for tour. 6 ziplines and 2 sky bridges. 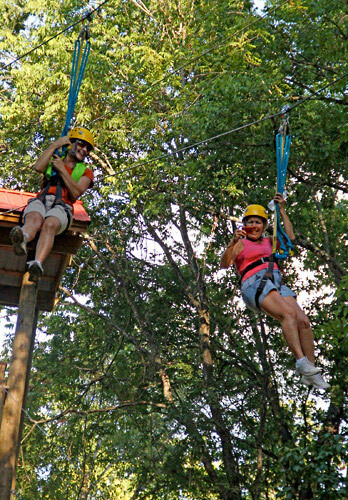 Zipline presented by Rafting in the Smokies at our Family Adventure Island, conveniently located right behind our river outpost in Hartford, TN. Feel the anticipation growing as you cross our 150' swinging bridge to the breathtaking 10-acre wooded island in the middle of the Big Pigeon River. After you receive your safety gear and instruction session with your personal adventure guide, you’ll climb high in the air on our impressive zipline tower. Get set for an adrenaline rush! Capri pants or shorts that are at least mid-thigh in length, t-shirt, and closed toe shoes. Due to harness placement, swimsuits and short shorts are not permitted. NO CROCS, FLIP-FLOPS, OR BAREFEET ALLOWED. For your safety, no drinks, alcoholic beverages or food are allowed on the trip. Rafting in the Smokies reserves the right to refuse anyone under the influence. Ziplines and rafting excursions are located at the same location at our river outpost where we have changing facilities, restrooms, and hot showers for your convenience. Yes, you have to weigh between 45 and 250 lbs. to participate. 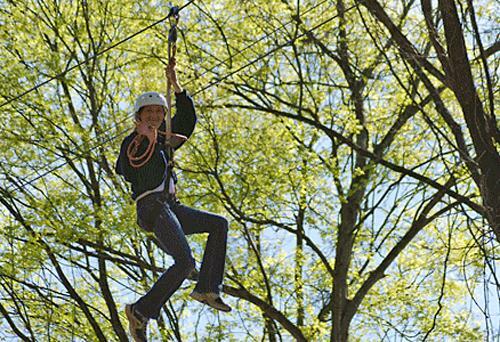 What do I need to wear for the Zipline? The best thing to wear is long shorts or pants. The material will make the harness more comfortable against your skin. You must also wear shoes that are secure around your ankles: No flip-flops, Crocs, or bare feet please. We recommend sneakers or water shoes. We have changing facilities complete with hot showers, so you can easily transition between outdoor adventure activities. There are six ziplines and two sky bridges. The lines are approximately 600 ft. long and are 40 to 60 ft. high. It will normally take one hour to complete the course. 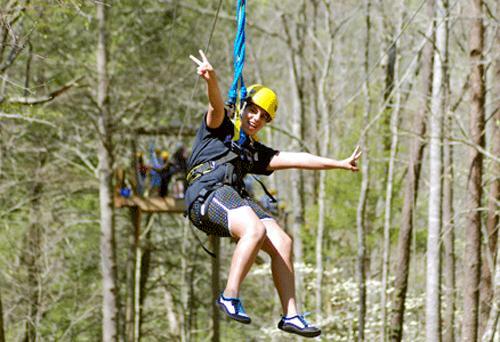 We operate the Zipline rain or shine — getting wet is half the fun! If there is lightning in the area, our Outpost Managers may delay until the storm has passed. We love liquid sunshine! Yes, children must be 5 years old and all participants must weigh at least 45 lbs. What times are the Zipline available? Can I schedule it on the same day as my Rafting/Ropes Course? 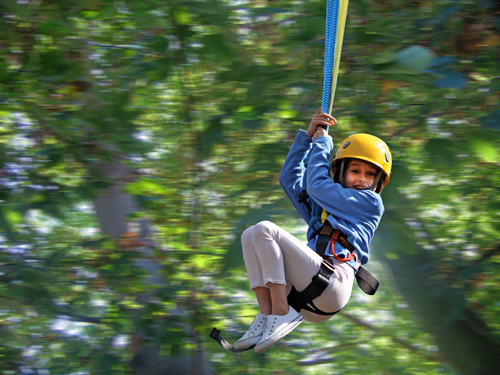 The Zipline operates from 9 a.m. to 8 p.m. and it is in your best interest to schedule all activities on the same day in order to eliminate unnecessary travel time. Usually we can accommodate your preferred activity schedule. 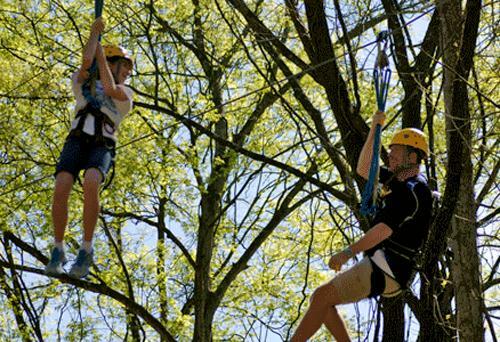 Is there more to do than Ziplining? There are lots of great outdoor activities to enjoy with us! We offer rafting and horseback riding (off-site). And while you’re visiting us take time to enjoy the picnic tables with BBQ grill, swings, bean bag toss game, swimming beach, and nature trail all on our Family Adventure Island accessed by a 150-ft swinging bridge.